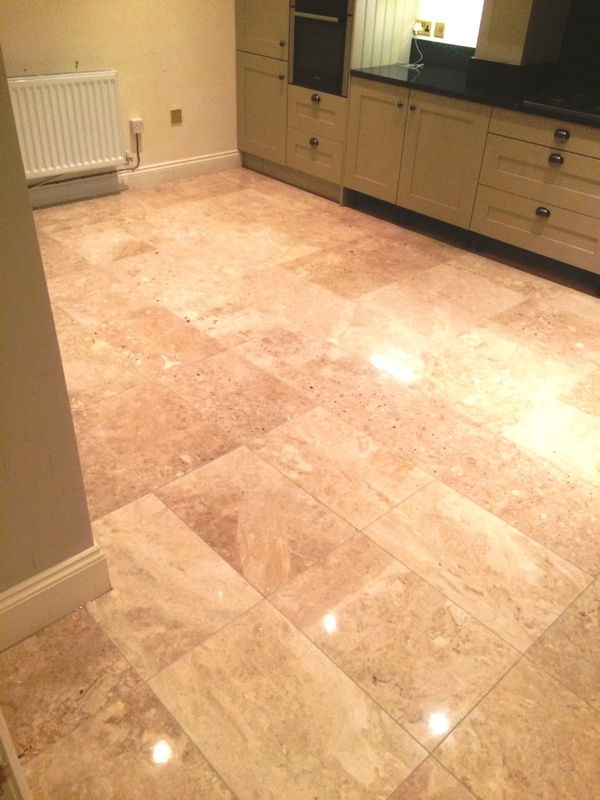 Although expensive Marble is a highly coveted, popular and classic flooring choice, not only is it hard wearing you can attain a high polish that simply looks fantastic. At peak condition, it’s one of the most beautiful and eye-catching types of stone available, however it’s appearance will degrade over time and with use, so it does need maintaining. 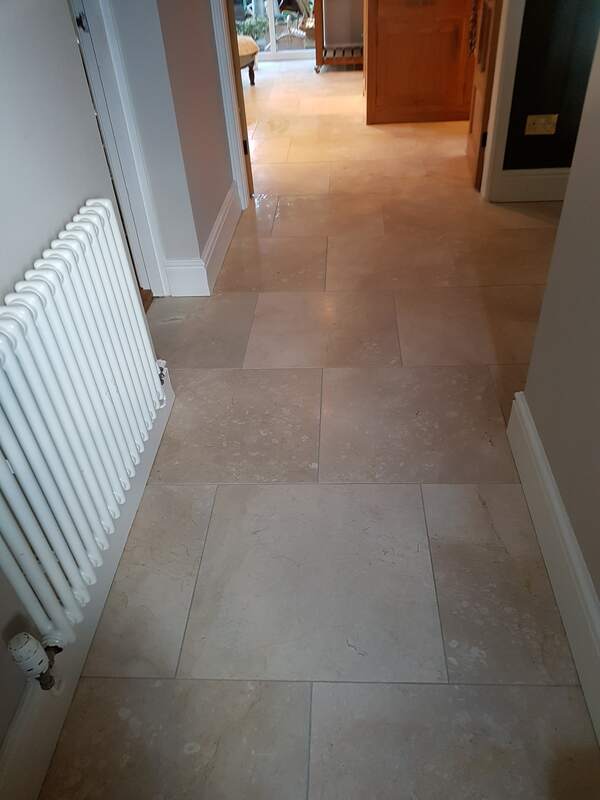 This customer, who lives in the small village of Willington in Cheshire had contacted us because they were concerned that the lustre on their Marble tiled floor which had been installed throughout much of the ground floor had faded and lost its attractive appearance. We arranged a date to go over and re-polish the floor back to health. 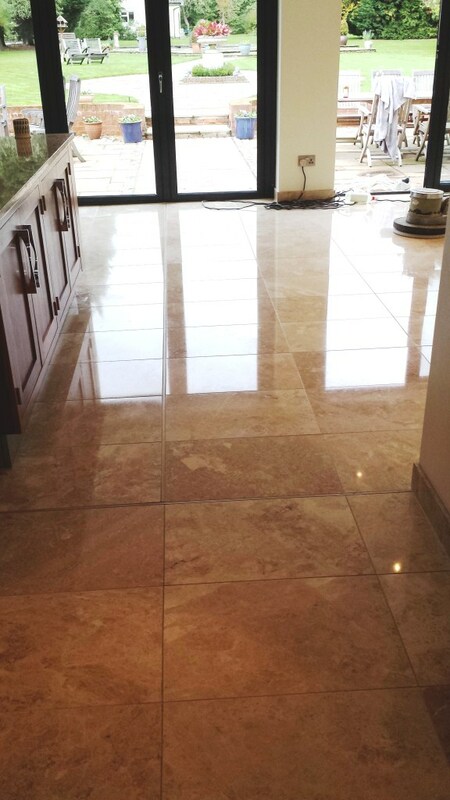 On arrival the first step was to give the floor a general clean using a mild dilution of Tile Doctor Pro-Clean which is an alkaline tile cleaning product that is safe to use on Marble. I mention this because there are many cleaning products on the market today which are acidic and really only meant for use on Vinyl and Ceramic tiles. 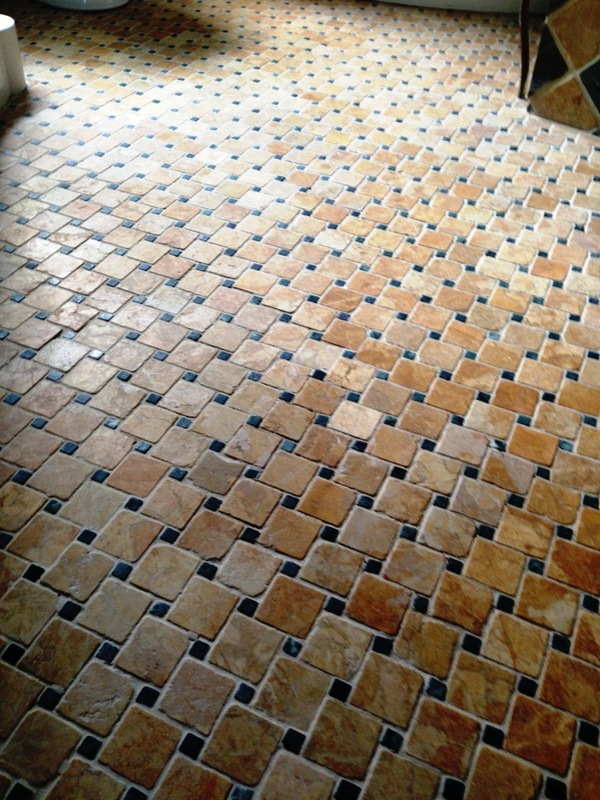 The cleaning solution was applied by sponge mop and left to soak for ten to twenty minutes with a particular focus on the grout lines. I used a stiff brush along the grout lines to get them really clean and then once done the floor was then rinsed with clean water and the now soiled cleaning solution removed with a wet vacuum. This process also has the added advantage of removing any grit from the floor which might cause scratching during the next stage which was to polish the floor. 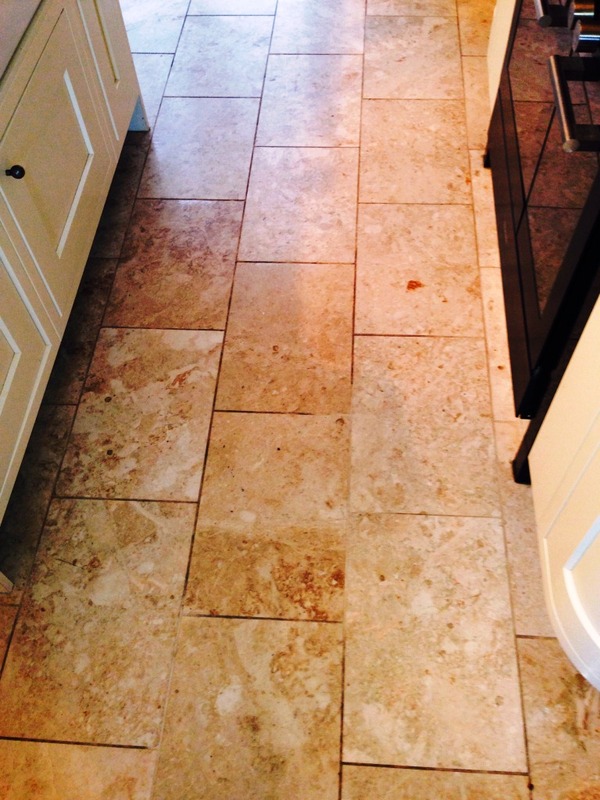 The next step was to use a set of Tile Doctor burnishing pads to polish the stone back to a deep shine. The pads which are encrusted with industrial diamonds are applied with a rotary floor buffer in sequence from coarse to extra fine. The first pad has a Coarse 400 grit which is applied with only water for lubrication, removes minor scratches, sealers, and the top surface dirt. Working in small areas, I applied the pad across the Marble, rinsing in between and picking up the soiled solution with a wet-vac machine. I then repeated this same procedure with the Medium 800 grit pad which is the first stage polishing pad again rinsing with water after use. The next two pads are a Fine 1500 grit and Extra Fine 3,00 grit which really build up a high-quality polish on the stone. The floor was left to dry off fully overnight and I returned the next day to seal the Marble first checking with a damp meter that the stone was dry. 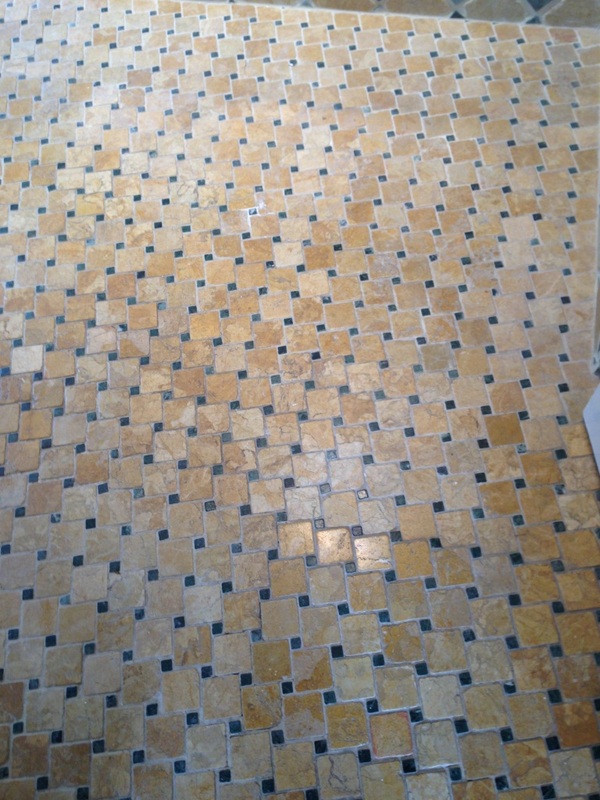 To seal the Marble tiles I applied two coasts of Tile Doctor Colour Grow which is an impregnating sealer that works by occupying the pores in the stone thus preventing dirt from becoming ingrained. 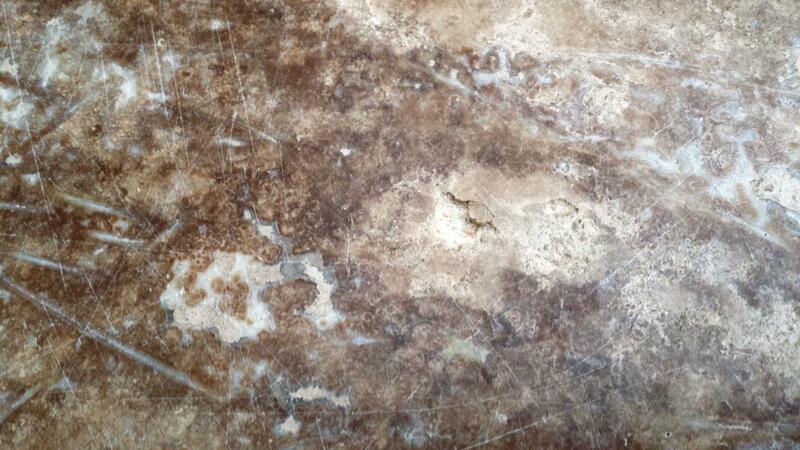 Colour Grow also has the added advantage of enchasing the natural colours in the stone and in this case brought out the deep brown colours in the Marble. 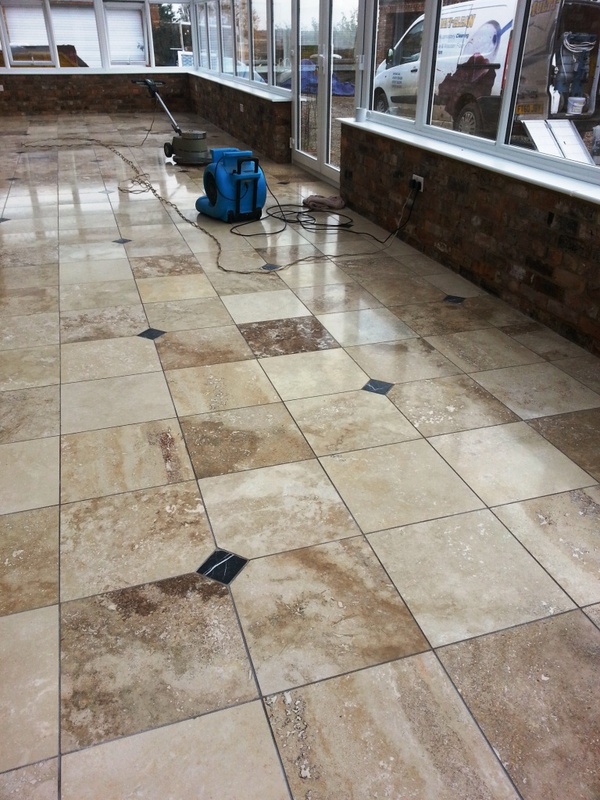 Once the sealer had dried the floor was treated to a gentle buff with a white pad to bring up the shine even further. 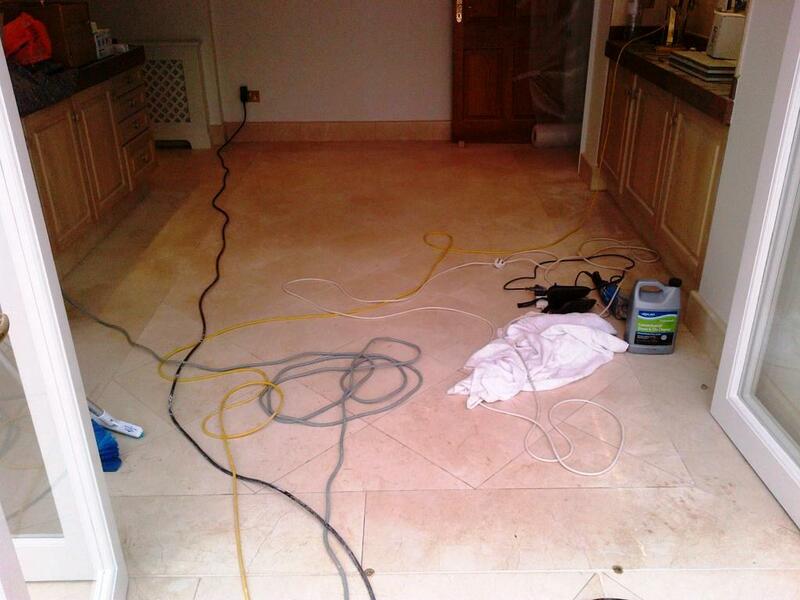 This White Tumbled Marble tiled floor at a house in Hampton had been installed throughout the kitchen and dining area ten years back and was now in desperate need of a deep clean and seal to remove dirt that had accumulated in the pores of the stone. Once the dirt gets into the pores it makes it difficult to keep clean which is exactly the problem the property owner had experienced. The ‘tumbled’ effect on the Marble is achieved by tumbling the tiles in drums to soften and age the edges and surface of the stone. However, it was difficult to appreciate this interesting style as the presence of dirt and staining was quite overwhelming and the owner was now keen to restore it back to its original condition. 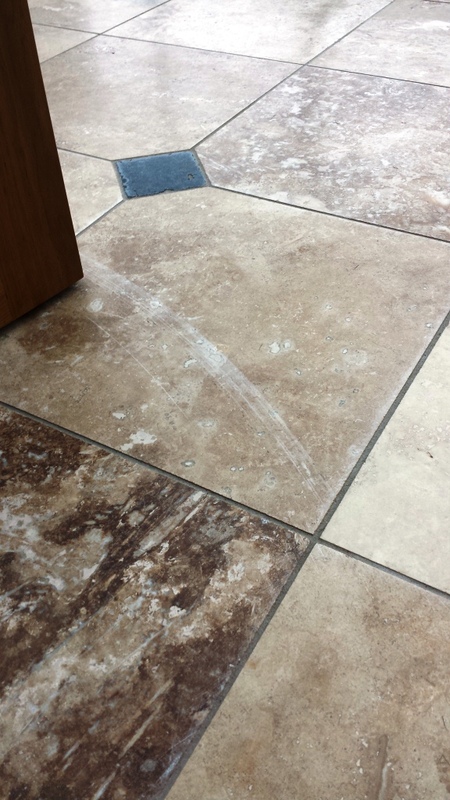 I started the restoration by applying a strong dilution of Tile Doctor Pro-Clean. This high alkaline cleaning product was spread across the floor and left to dwell for a short period, before I then worked it deep into the pores of the stone using a heavy duty rotary scrubbing machine. Next, some of the stubborn, more deeply ingrained stains were scrubbed by hand, along with the grout lines, which were also particularly dirty. The resulting slurry of water and cleaning solution was then pressure rinsed away and soaked up with a wet vacuum. The floor was then inspected and areas that needed more attention were retreated using the same process followed by a final rinse with water. The wet vacuum was then used again to extract as much moisture from the floor as possible before leaving the now clean floor to dry off fully overnight ready to accept a fresh coat of sealer the next day. I returned to the property the following day and took a few moisture readings to ensure the Marble had dried off completely overnight. This is critical because even a small amount of excess moisture can damage the performance of the sealer. Once I was satisfied that the tiles were dry I proceeded to apply two coats of Tile Doctor Colour Grow, a sealer which impregnates the pores of the stone, therefore protecting it from within. It also enhances the natural colours in the stone at the same time, hence the name ‘Colour Grow’! The new sealer will now make it easy for the customer to maintain the floor and avoid the build up of dirt over time in the same way that it had before. It will also protect the stone against spillages. Overall I think it’s fair to describe the result as a complete transformation. 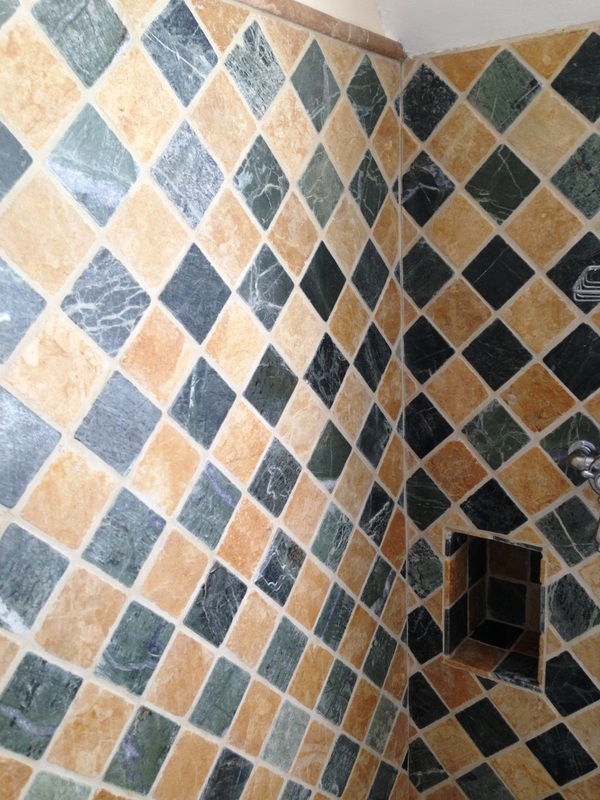 The tiles are bright and clean – and now they will stay that way! 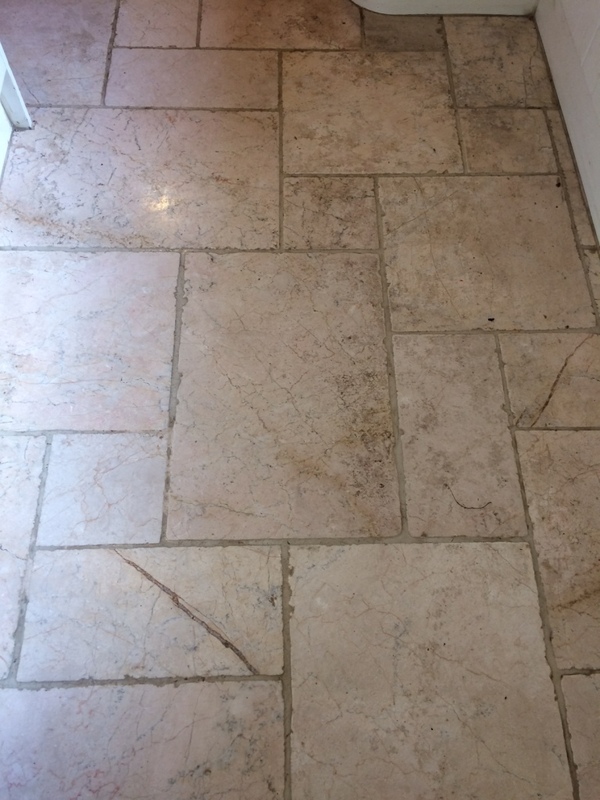 Certainly, the customer was pleased with her newly restored White Tumbled Marble tiled floor. 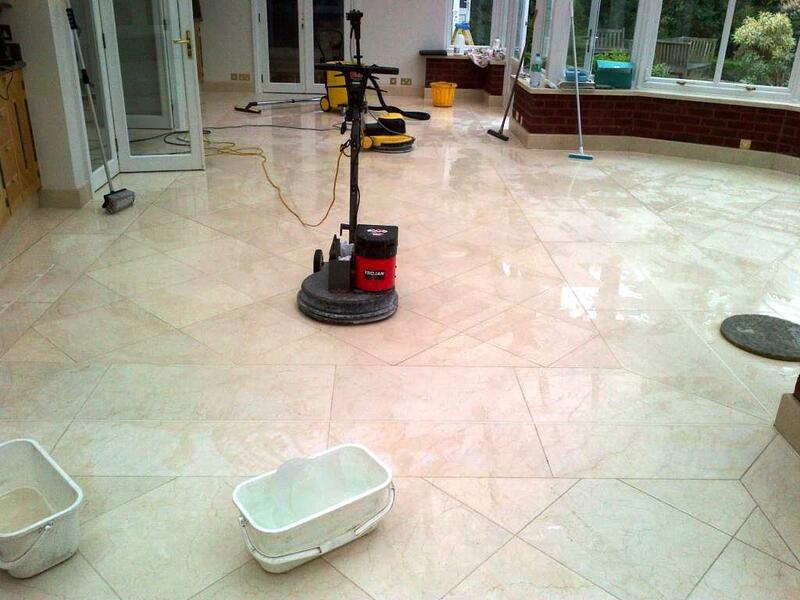 When you have high quality tiles like Marble, Limestone and Travertine, it’s even more important than normal to use suitable cleaning products. 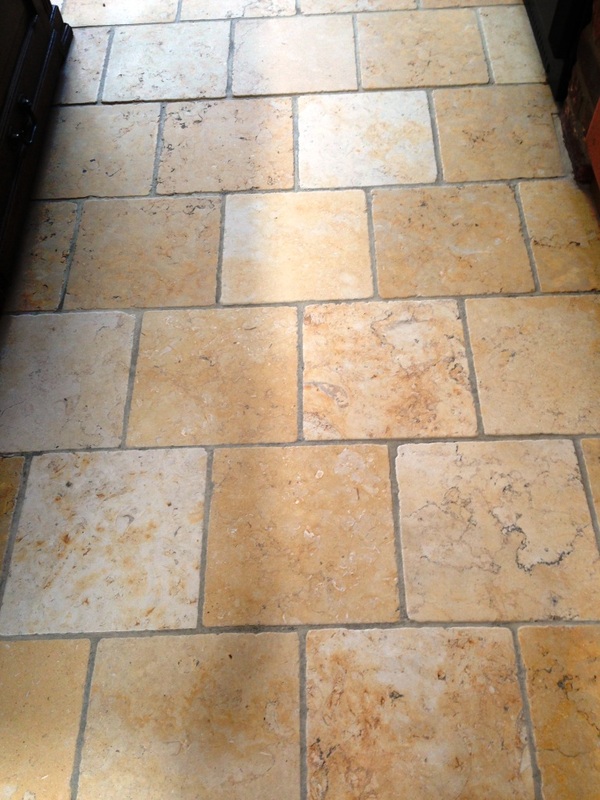 If, for example, you apply a slightly acidic cleaner to Limestone, it can cause severe, irreparable etching that significantly damages the appearance of the stone. 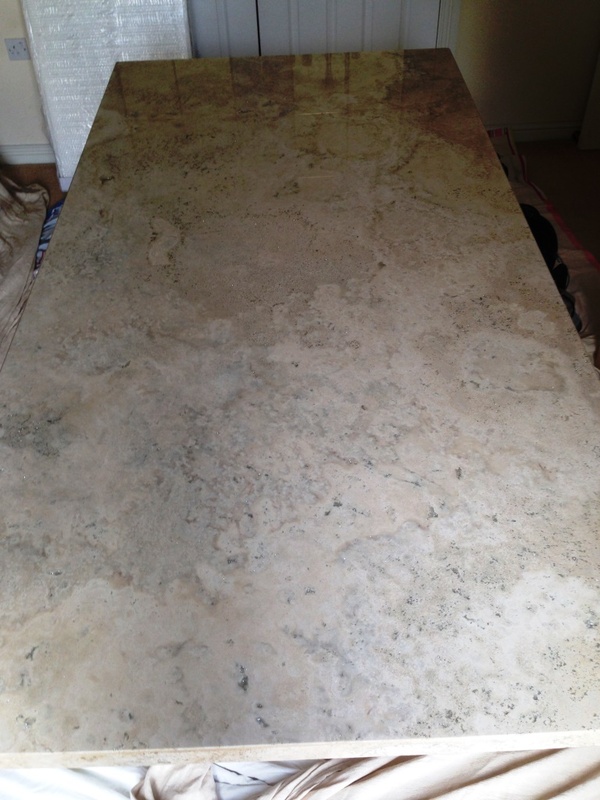 In a similar way, this customer in Penrith had been using an unsuitable wax-based liquid soap to clean her “Crema Marfil” Spanish Marble kitchen tiles. It had failed to prevent a heavy buildup of dirt, and had in fact darkened the stone, leaving it looking stained, unnatural, and all-around difficult to clean. To avoid the floor becoming a complete nuisance, the customer contacted me to see what could be done to alleviate the problems. I explained to the customer that a process we use at Tile Doctor known as burnishing would be the most effective way to clean the Marble. 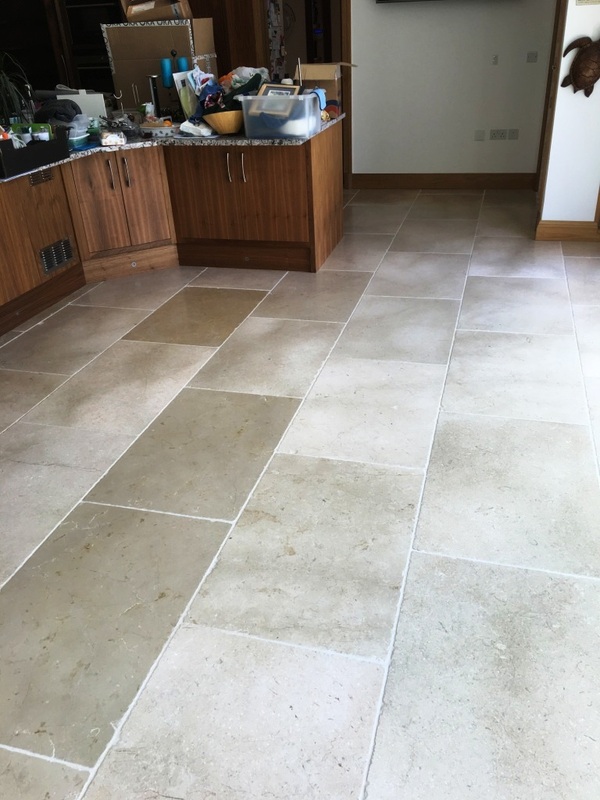 Also suitable for Limestone and Travertine, this process involves the sequential application of specialist diamond encrusted pads of different grits to grind down any soil buildup and gradually create an aesthetic polish in the surface of the tiles. Our system consists of four burnishing pads: Coarse, Medium, Fine and Very Fine. 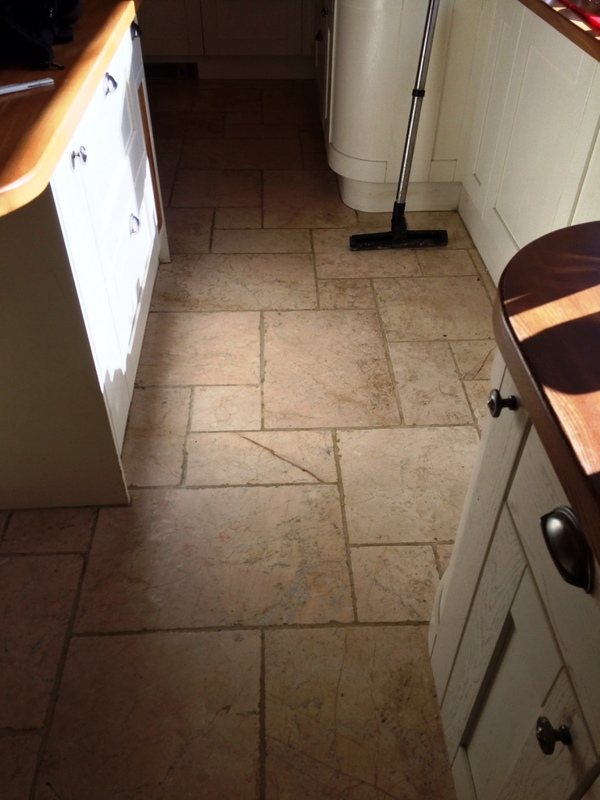 I started, using a little water as lubrication, by applying the Coarse pad across the floor, as its rough grit is ideal for breaking down stubborn dirt and stains – and doss so without damaging the tile in any way. Satisfied with the initial cleaning result achieved by the Coarse pad, I proceeded to work my way through the four burnishing pad system, applying the Medium, Fine and Very Fine pads in turn to restore the polish to the tiles. 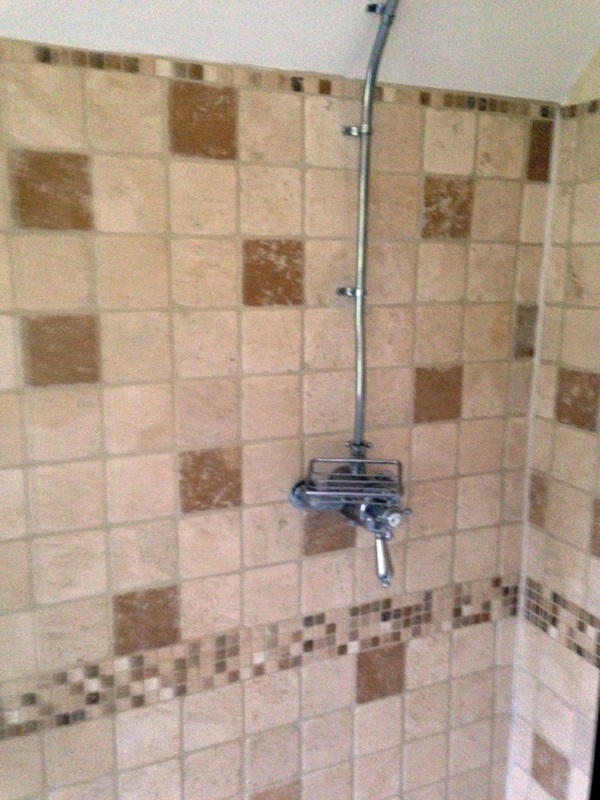 Following this, I paid some specific attention to the dirty grout, cleaning it with our reliable, multi-purpose alkaline cleaner, known as Tile Doctor Pro Clean, in combination with a steaming system. After completing the burnishing process, I left the tiles to dry overnight. Upon my return to the property I polished the floor one final time with the Very Fine pad before deciding that it was time to give it a fresh seal. 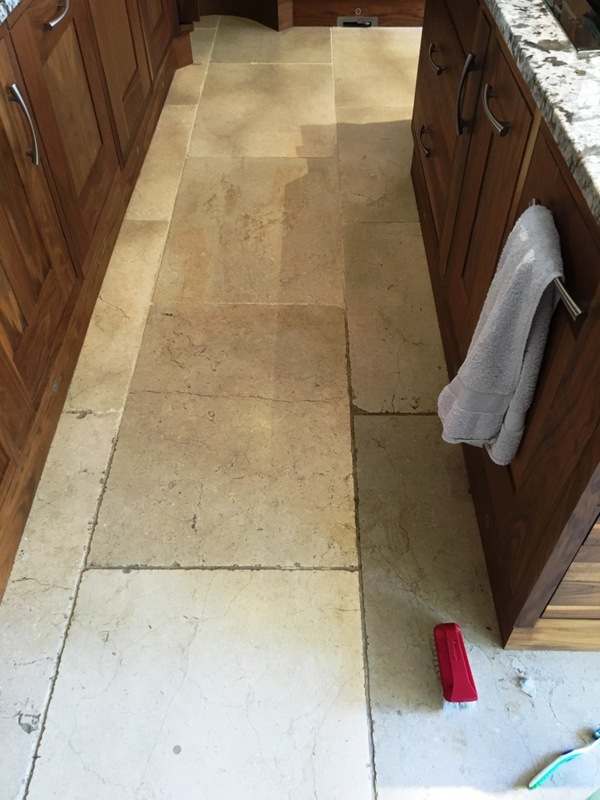 My choice of sealer in this situation was Tile Doctor Colour Grow, an impregnating, colour intensifying sealer that I knew would really do well to emphasise the natural beige shades in the Marble. I applied two coats of the sealer, before polishing off the excess with a buffing pad and leaving the tiles to dry again for a few hours before they could be walked on again. My customer was very pleased with the outcome. Naturally, she was drill quite concerned about keeping the tiles clean in the long term, so I left her with a complimentary bottle of Tile Doctor Stone Soap, which is specifically designed for aftercare cleaning on polished Marble, Limestone and Travertine. 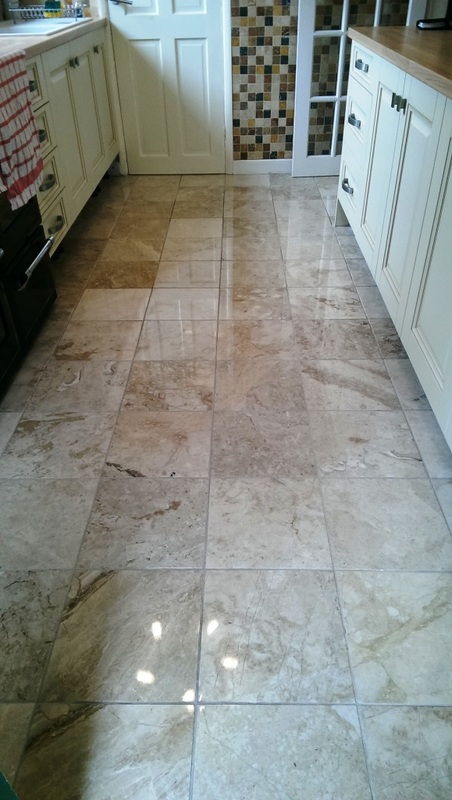 The photographs before are of Marble floor installed in the kitchen of a house in Melton Mowbray, that we recently refinished. 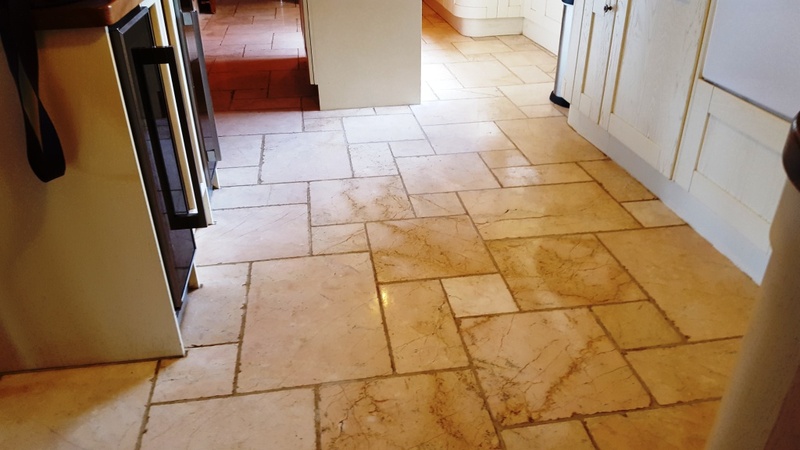 The honed matte marble tiles had previously been finished with a water-based topical floor sealer by the customer to create a polished finish; unfortunately the coating had become damaged, worn and now soiled. To restore the finish with something more durable we recommended the removal of any remaining coatings, then re-finishing with our restorative diamond encrusted burnishing pad system and then re-sealing with an impregnating rather than topical sealer. Our quote was accepted and we returned on the agreed date to restore the floor. 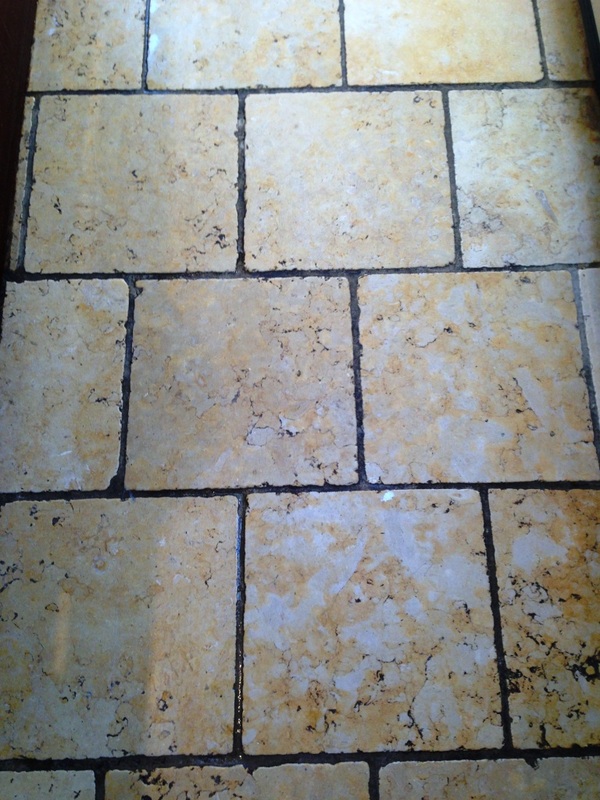 The first step was to remove the old coating and clean the grout using a strong dilution of Tile Doctor Pro-Clean which is a strong alkaline formula that is safe to use on stone. 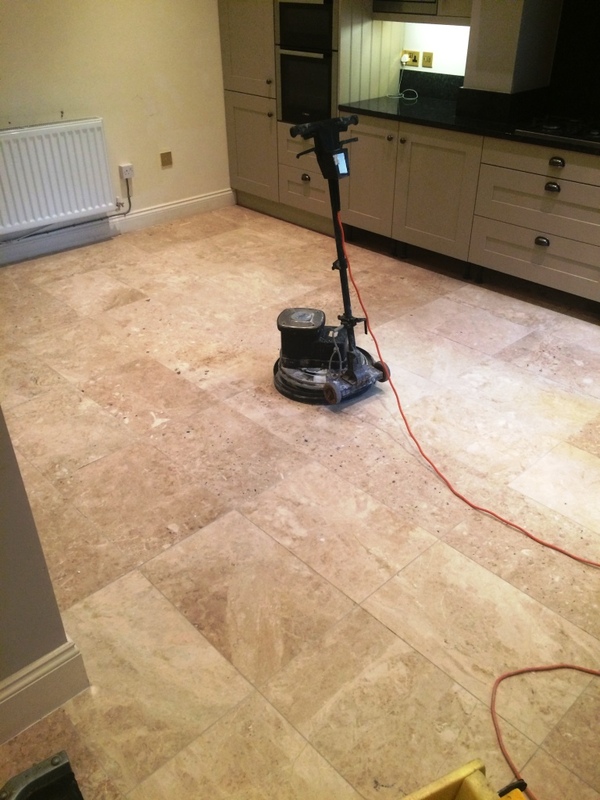 The solution was scrubbed into the grout using a stiff brush and also worked into the Marble floor using a rotary machine fitted with a black scrubbing pad. The now dirty cleaning solution was then rinsed away using water and extracted with a wet vacuum. The next step was to burnish the floor using a set of Tile Doctor burnishing pads starting with a coarse pad to strip the Marble back and then moving onto the finer grit pads from medium to extra fine to re-build the polish. The pads are lubricated with a little water and you need to rinse the floor after each pad. We left the floor to dry overnight and then came back the next day to seal the floor with Tile Doctor Ultra Seal which is a premium, no-sheen, natural-look impregnating sealer formulated to provide maximum stain protection and recommended for food preparation areas, two coats were sufficient. 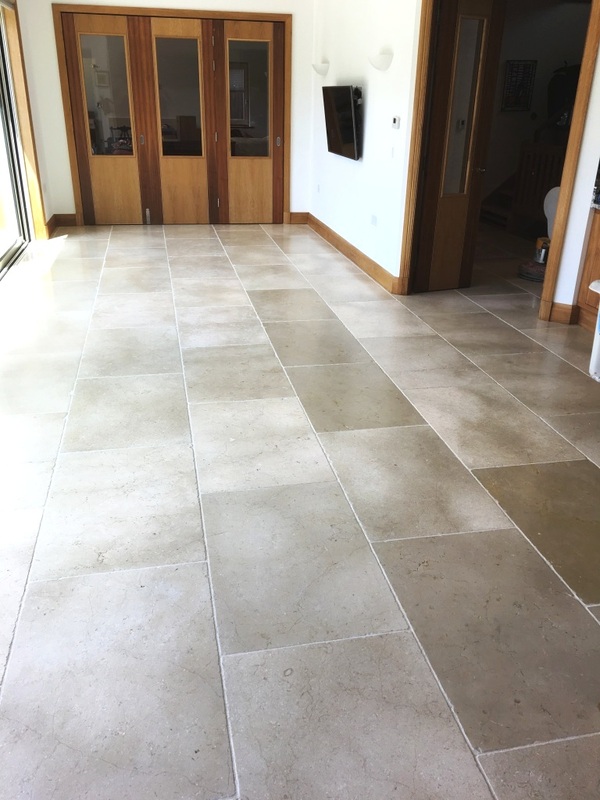 Once completed we recommend that the floor was maintained using Tile Doctor Stone Soap which is an after care cleaning solution designed for honed or polished stone floors. For this job I travelled to the town of Albrighton, which is actually the most easterly settlement in the whole of Shropshire. 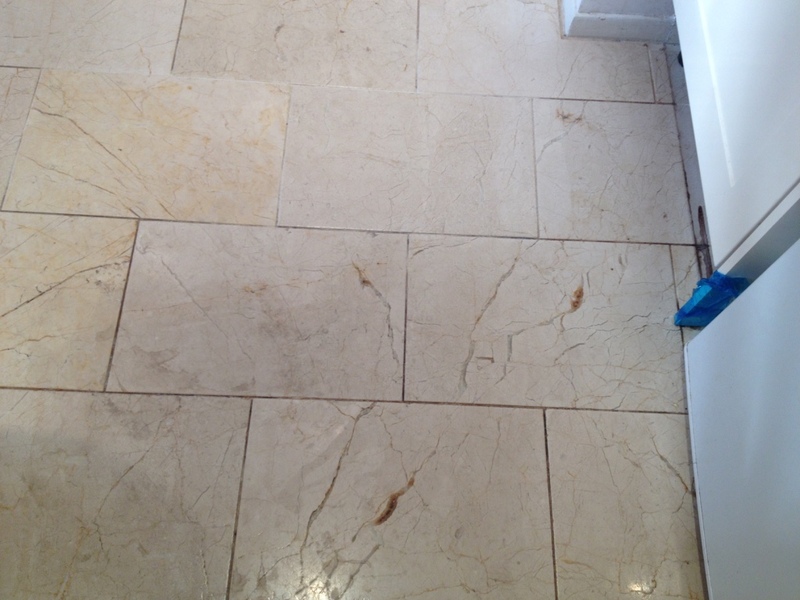 My client had an issue with their Marble tiled floor which was installed in the kitchen and hallway. They had dropped and broke a bottle of vinegar in the kitchen, and the substance unfortunately came in contact with the tiles. Since Marble is highly sensitive to acid, the vinegar (an acetic acid) had basically etched the surface of the tiles make it impossible clean chemically. 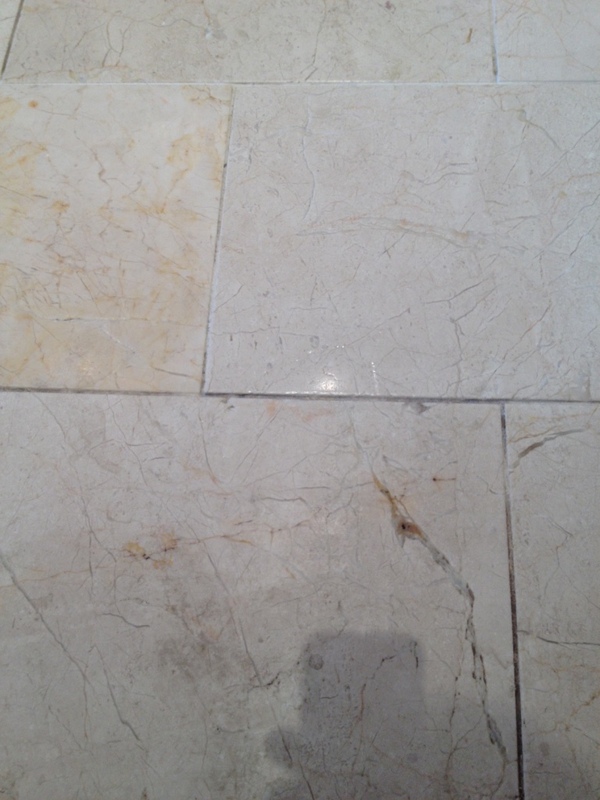 Although the tiles were a nice, expensive Marble, the person who had first installed them had done a poor job, leaving lippage of up to 5mm in some areas, which would make work trickier. Undeterred I could see it would be possible to restore the floor using a combination of burnishing for the tiles and cleaning with a high alkaline product for the grout lines. 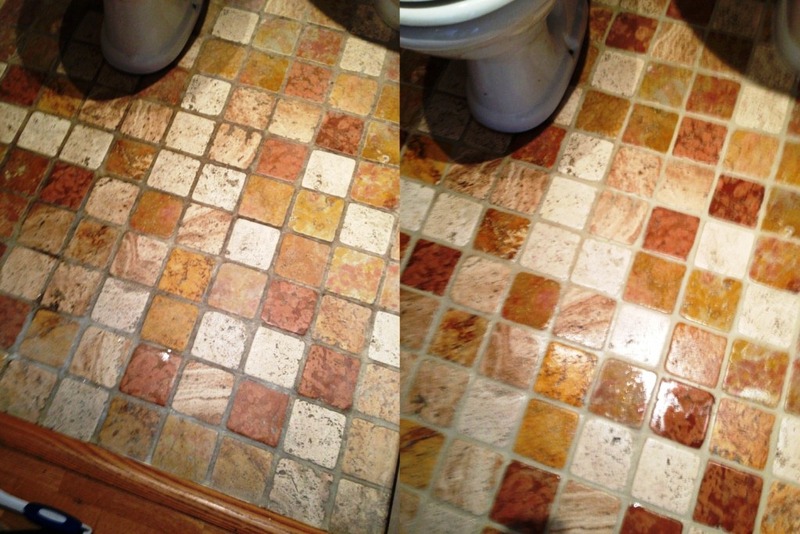 I demonstrated this to my client on one tile which went well and I was then given the go ahead to restore the entire floor. My first task focused on cleaning the grout lines using a solution of Tile Doctor Pro-Clean worked in with a stiff grout brush. 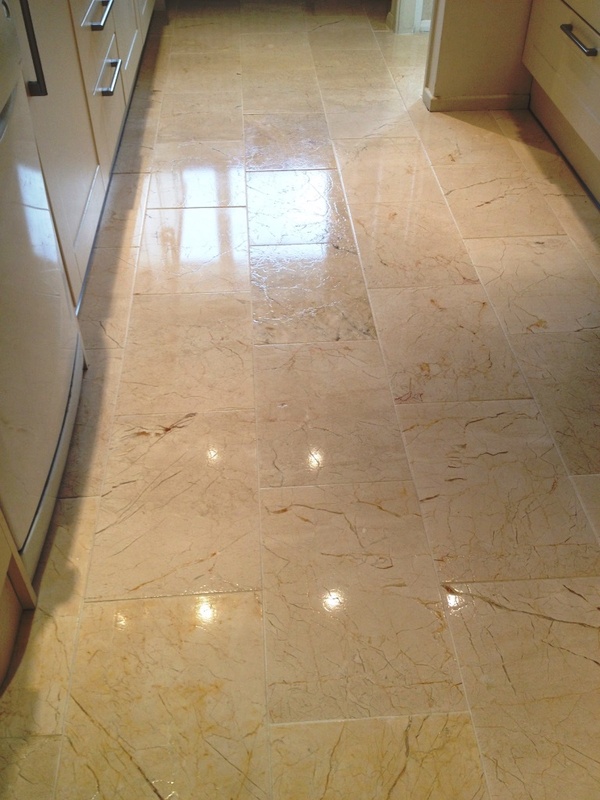 Pro-Clean is a high alkaline cleaner suitable for use on most types of natural stone floor. 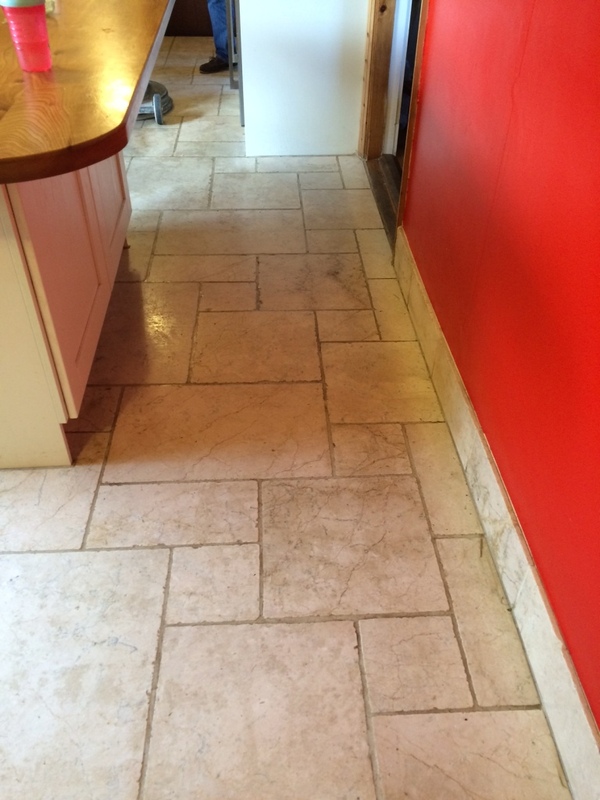 It helped to alleviate most of the grout staining caused by the vinegar, whilst also lifting out any ingrained dirt and muck, and this left the grout looking a lot cleaner. After cleaning the grout lines I was able to move on to burnishing the tiles. As previously mentioned, no chemical product would be able to have an effect on the damaged tiles, so I resolved to burnish them using a system of four diamond encrusted burnishing pads fitted to a rotary machine. Working first with a coarse burnishing pad, and moving through to medium, fine and very fine pads, lubricated with a little water, I was able to significantly reduce the appearance of the acid stains, while also giving the tiles a nice polished finish. Following the cleaning and burnishing processes I gave the tiles a good rinse to remove any remaining residue and then ensured the floor was completely dry before starting on the sealing. Shine Powder on the other hand is a crystallising powder that is ground directly into the tiles to provide a high shine finish and durable surface protection. 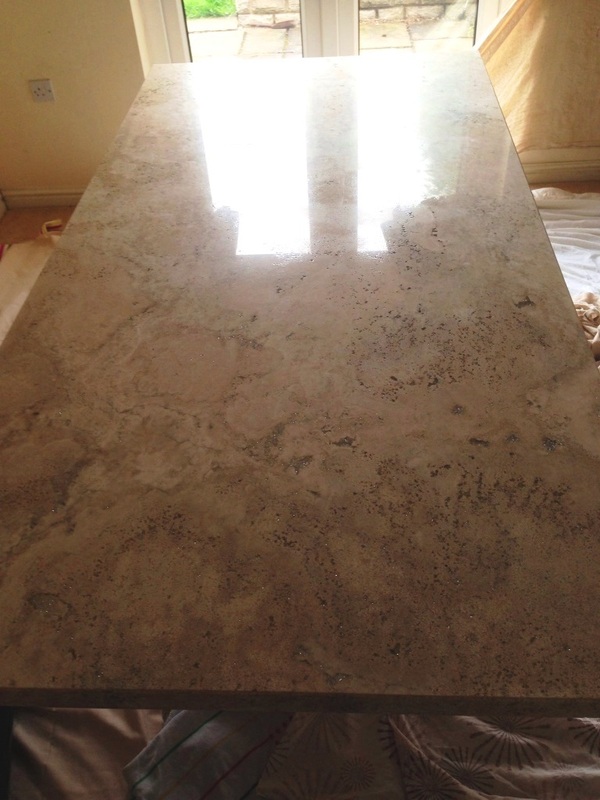 This beautiful Marble kitchen worktop has been installed in a house in the village of Prestbury some years earlier and was now looking rather dull and spoiled by wine glass marks. The polish can be restored on these worktops in a similar way to that of a Marble floor the only difference being you have to use smaller more manageable burnishing pads. After protecting the floor with sheets I proceeded to re-polish the Marble worktop with a set of six inch burnishing pads fitted to a hand held machine. Similar to floor burnishing you start with a coarse pad to remove scratches and ingrained dirt lubricated with a little water and then move onto the polishing pads from Medium, Fine through to Super Fine. 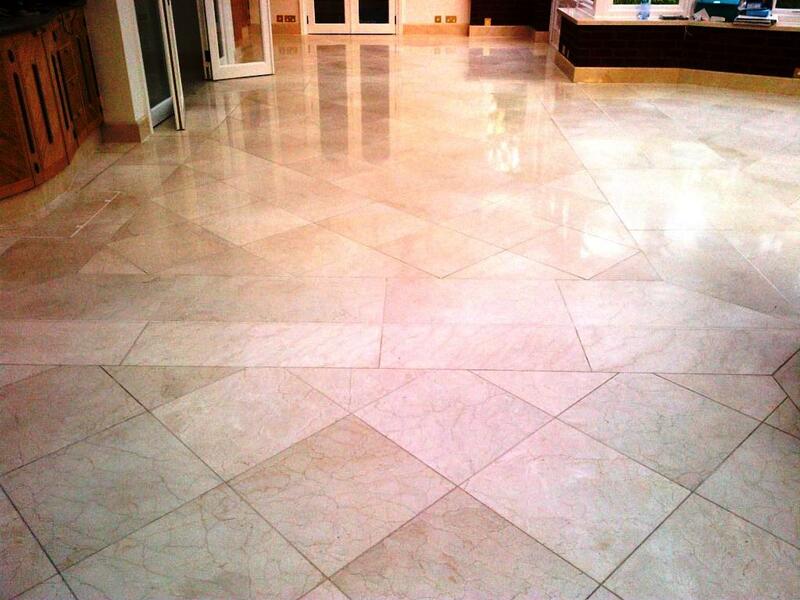 You need to wash down the Marble in-between each pad as the water does become soiled from the burnishing process. 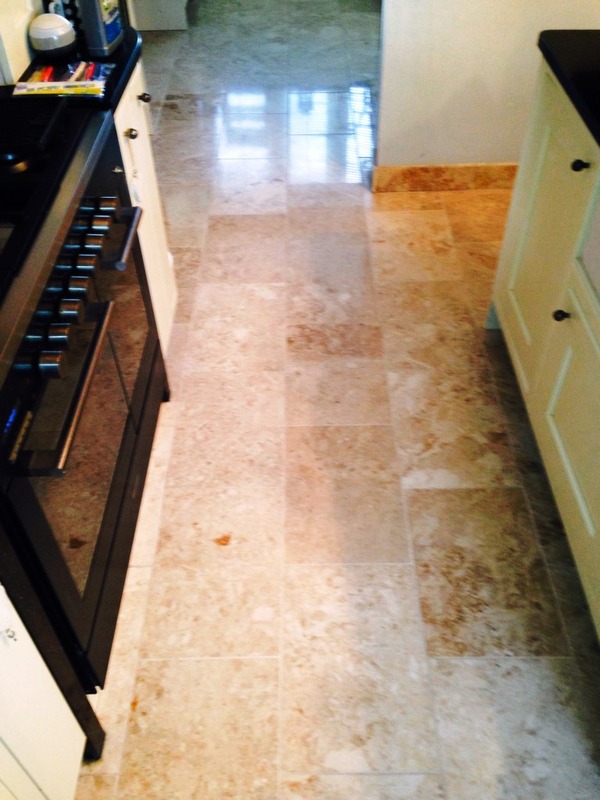 For the regular maintenance of Marble and Granite worktops we recommend the use of Tile Doctor Stone Patina spray which helps build up lustre on the stone as well as cleaning it. 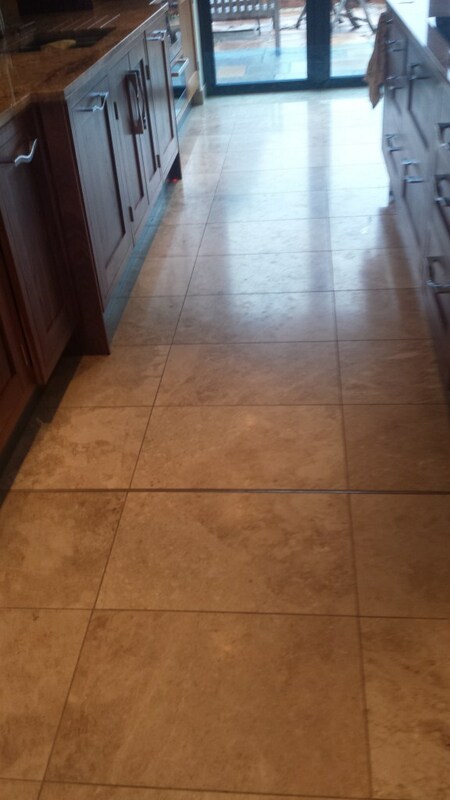 This Polished Marble floor had been installed in the kitchen of a house near Leicester, it had been some time since its last deep clean and re-polish so the tiles had started to look dull and lifeless. 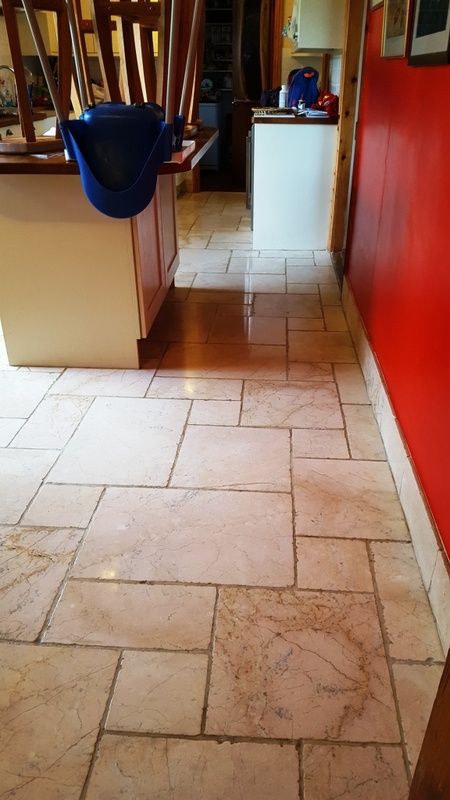 To resolve the floor was cleaned using a dilution of Tile Doctor Remove and Go worked in using a scrubbing pad to remove any remaining sealer and dirt especially along the grout lines. Once this was done the floor was burnished using a set of Tile Doctor burnishing pads which strip the Marble back and then re-builds the polish. These diamond encrusted pads come in a number of different grades and each one does a different job from scrubbing to polishing. I started with the coarse pad together with a little water and this does the job of stripping back the surface of the floor. I then moved onto the finer grades which do the job of building the surface polish to a nice shine. The next morning I arrived to find the floor had dried out enough for me to seal it which was done using a couple of coats of Tile Doctor Ultra Seal which is an impregnating sealer that provides a natural look and is recommended for use in food preparation area. Once it was finished the floor took on a new lease of life and the deep shine has been restored. 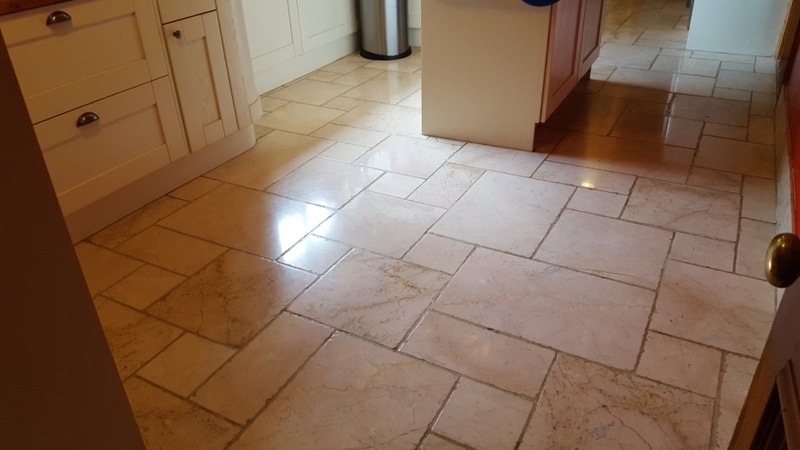 This was a Marble tiled floor installed in the kitchen of a house in Olney, Bedfordshire which had been scratched in places and was now overdue for some TLC. 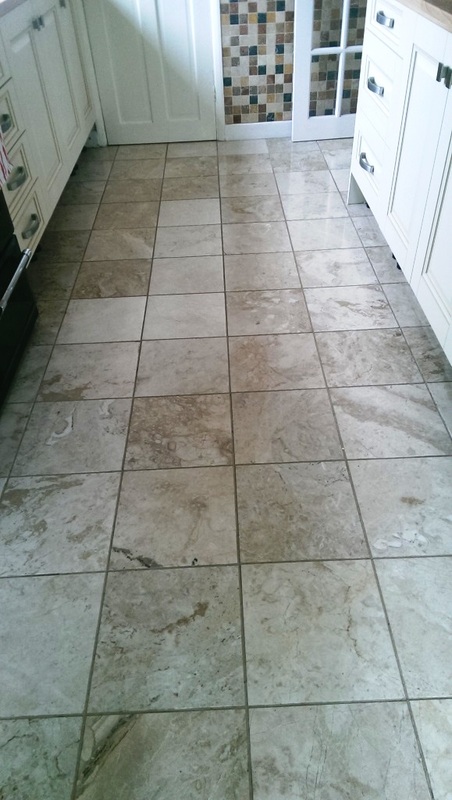 The first job was to give the floor a general clean using a dilution of Tile Doctor Pro-Clean which was left to dwell on the Tile and Grout for a short while before being worked in with a rotary machine fitted with a scrubbing pad and a stiff hand brushes along the grout lines. The floor was then washed down with clean water to remove the soiled cleaning solution with the liquids being removed using a wet vacuum. To restore the original finish and remove the scratches the floor needed to be cut back using a set of diamond encrusted burnishing pads. The pads come in a set of four and you start with the coarse pad and a little water and then move on to the Medium, Fine and Very fine pads at which point the surface looks immaculate and polished. The next task was to protect the floor and bring up the appearance even further by applying Tile Doctor Shine Powder which is polished into the floor using a buffing pad; the powder add a really deep finish to the appearance of the Marble and hardens on the surface to provide durable surface protection. Hopefully you can appreciate the difference in the Marble from the photographs; it was a tricky subject to capture due to the lighting; however I can tell you the customer was amazed by the finish. 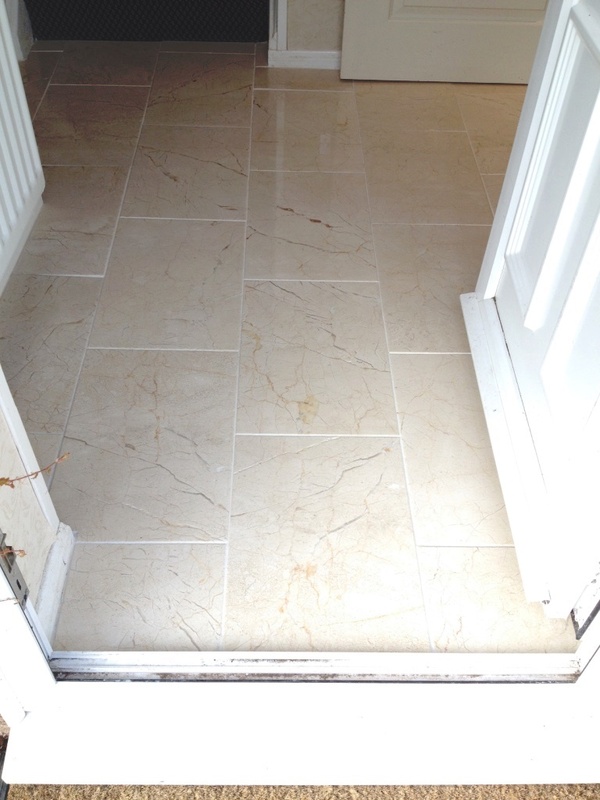 This Marble Tiled floor was installed in the conservatory of a house in Woodhall Spa who had asked if we could remove the scratches from their inherited marble tiles around the door area and where furniture had been dragged across the tile as shown in the photos. Interestingly our customer is a chief engineer on cruise ships all over the world and knew what this floor could look like if restored professionally. Other than the scratches the majority of the floor had been well maintained so the solution was to burnishing the marble back to its original condition using a set of diamond encrusted pads fitted to a slow speed machine and lubricated with a little water. The burnishing pads come in a set of four and applied to the floor with a little water one by one using a rotary machine running at slow speed. The process starts with the coarse pad which strips back the top layer and removes sealers and dirt from the surface of the stone. The pads then become finer and finer with the last pad being a final polish that takes the tile back to near it’s originally intended shine. 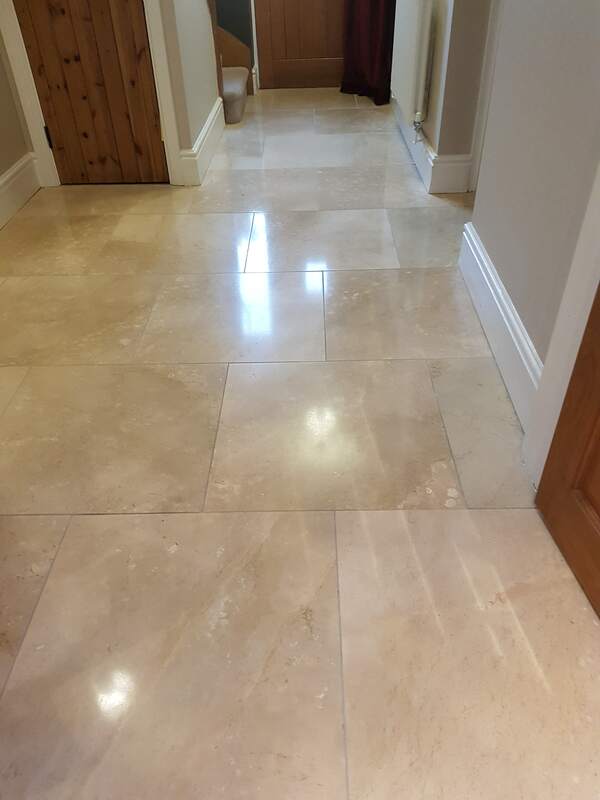 You can see from the photographs that we actually managed to resurface the marble, remove the scratches and we also filled in some small holes and then allowed the floor to dry overnight helped by our turbo drying system allowing for minimal drying times. 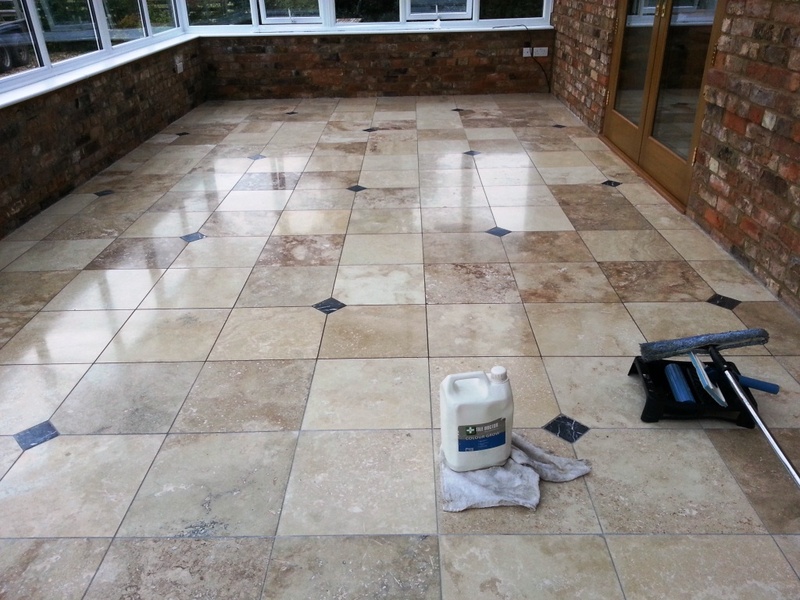 The next day we applied two coats of Tile Doctor Colour Grow sealer to the tiles, the sealer fills the pores of the stone protecting it from stains and this particular sealer also lifts the natural colours in the stone. As you can see the scratches were removed and the tiles now shine and are protected and polished to a stunning finish that the customer was over the moon with and couldn’t thank us enough for the professional and excellent job on time and budget. 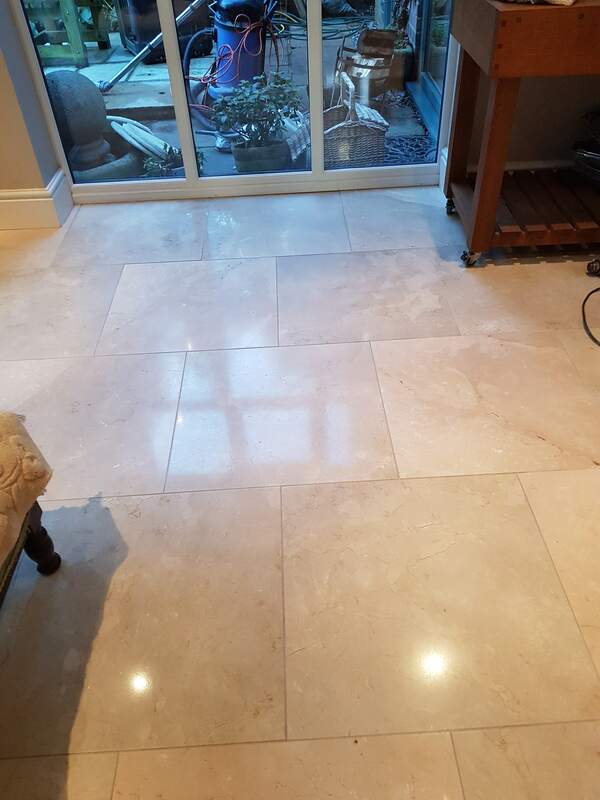 These photographs were taken at a house in Ealing, West London where the customer had requested a deep clean and polish of the marble tiled floors installed in a kitchen and conservatory which had become dull and dirty over a period of time. The first step was to give the Marble floor a thorough clean throughout with a medium dilution of Tile Doctor Pro-Clean which is an industrial strength Tile Cleaner safe to use on natural stone floors, we also took this opportunity to use a stiff brush along the grout lines to get them nice and clean, the soiled cleaning solution was removed using a wet vacuum and the floor rinsed with clean water. The next step was to use a set of diamond encrusted Twister Burnishing Pads fitted to a rotary buffing machine to polish the floor. The pads come in a set of four; you start with the Red pad together with plain water and this cuts through and removes surface grime and any surface seal. You then progress through one by one until you get to the final Green polishing pad which provides a high polish, we managed to complete most of this process before the end of day. 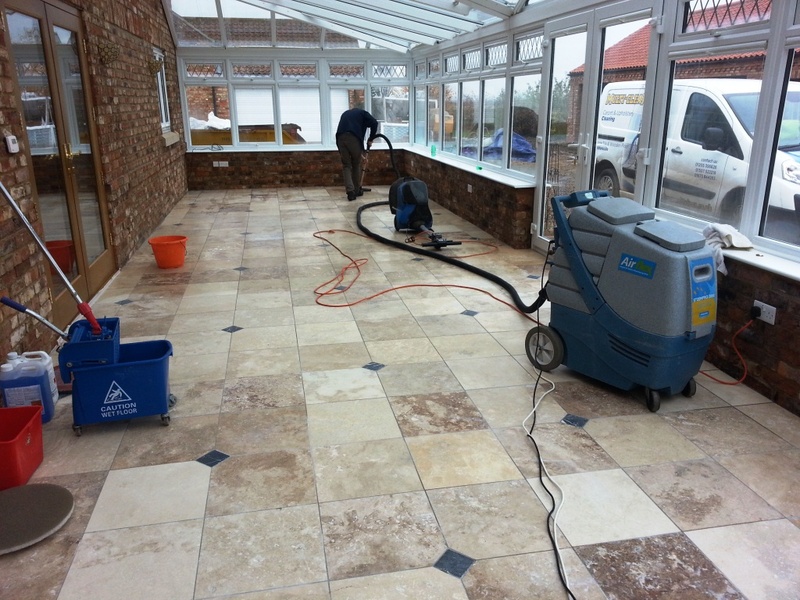 The next day we completed the polishing process with the Green pad which really brought a deep shine to the floor. To protect the floor it was then sealed using Tile Doctor Colour Grow sealer which provides a natural finish whilst enhancing the natural colours in the tile. We waited for the sealer to dry before buffing it with a white buffing pad to bring up the shine further.